also have to say yes. Western leaders call the referendum illegal. "In December 1991, after the declaration of independence, a referendum was held on whether to proceed. More than 90 percent of the population voted in favor. ... In Crimea, more than half of voters backed Ukrainian independence. ... If the population of Crimea wants to 'forever separate from Kiev,' it should be clearly stated on the referendum. ... How seriously can one take a referendum when voters are being closely watched by 16,000 heavily-armed, recently-deployed Russian troops?" 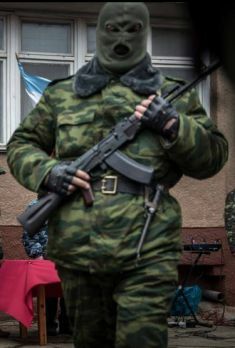 A Crimean army recruit after taking his oath of office - in a mask, just days after Russian Prime Minister Medvedev disparaged opposition protesters for wearing them. A substantial portion of Ukrainians are indeed Russian-speaking, but that doesn't make them Russia-minded, writes Marc Jansen. "Russian speakers see Ukraine as their homeland as well." Putin has some "valid arguments," argues Thomas von der Dunk in his commentary on the division of Ukraine and the way Russia is using it. A "substantial portion" of the population, concentrated in the east and south, is "Russia minded." Discrimination against the Russian minority by the new government is "not inconceivable," given the "new language law." To start with the latter: Kiev has not adopted a new language law. President Yanukovych pushed a new language law through parliament in 2012 (at the rate we are accustomed to from him). He needed votes for the upcoming parliamentary elections and this seemed like a useful (read populist) approach. The law gave "minority languages" (read: Russian) official status alongside the state language, Ukrainian. Think what you will, but even in the preceding period, there was no discrimination against the Russian language in the Russian-speaking part of the country. Those who felt discriminated against were in fact Ukrainian speakers in the east and south of the country. The new regime has, in short, not adopted a new language law. Rather, the language law of Yanukovych has been repealed by parliament. That was inconvenient and interim President Toertsjinov has therefore reversed the decision. In principle, the best thing would be to pass a completely new language law based on genuine equality - and there are calls in that direction. One thing is certain: stories about discrimination against the Russian minority are baseless. A substantial portion of Ukrainians are indeed Russian-speaking. Does that also make them Russia-minded? It depends on how you look at it. In December 1991, after the declaration of independence, a referendum was held on whether to proceed. More than 90 percent of the population voted in favor. In the Russian-speaking eastern provinces of Donetsk and Lugansk, a large majority was in favor as well, and even in Crimea and Sevastopol, more than half of voters backed Ukrainian independence. However, when it came to the economy, in the years that followed Ukraine went from bad to worse and a separatist movement was stoked in Crimea, thoroughly incited by politicians from Moscow. President Yeltsin couldn’t deal with this as he was confronted himself with separatists in Chechnya with whom he began a devastating war. So the matter was hardly discussed. Polls in recent years show that the vast majority of the population, including local Russians, see Ukraine as their homeland. That was, in any case, true at the time of the polls for almost half the Crimean population. By the same measure, a vast majority of Ukrainians are opposed to the possible secession of their region, and even of it acquiring autonomy. However, the population of eastern Ukraine opposes the imposition of a cultural identity by fellow countrymen in the west of the country. Of course, these relationships may have been disrupted after Putin threw a bat amongst the pigeons, but it's good to keep this in mind. That the provincial authorities in Donetsk and Kharkiv are preoccupied by pro-Russia activists says nothing about the mood of the local population. There are stories about "tourists" from Russia said to be responsible for this. The Crimea was always "traditionally Russian" says von der Dunk. In reality, the peninsula was annexed in 1783 by Catherine the Great, whereupon the local population of Crimean Tatars were bullied into leaving or were deported outright in three separate waves. Replacing them were mostly Russian settlers. 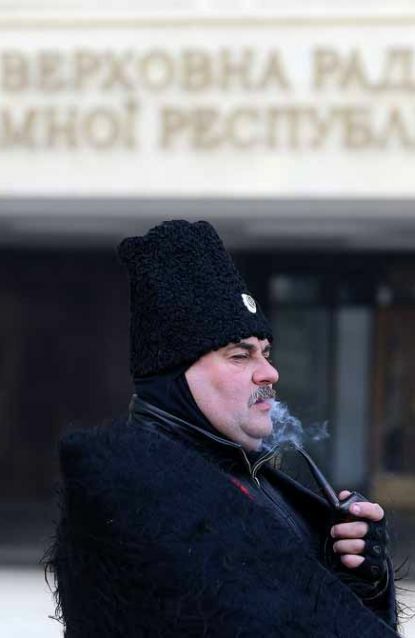 Nowadays, the Crimean Tatars comprise about 15 percent of the population. They are absolutely not pro-Russia and are holding their collective breath over what will happen to them if the peninsula remains in Russian hands. If the population of Crimea wants to "forever separate from Kiev," it should be clearly stated on the referendum which local Prime Minister Aksjonov organized for March 30 (at the last local elections, he received four percent of the vote). Although, how seriously can one take a referendum when voters are being closely watched by 16,000 heavily-armed, recently-deployed Russian troops? *Marc Jansen is a historian. At the end of March, he will publish his book Border Country: A History of Ukraine.